Silberra S-19 Developer is a universal single-solution developer designed to achieve images of medium to high and high contrast. It can be used as standard or sensitometric developer for different types of photo materials like X-ray films, photo plates (also for astrophotography), materials for microfilming, a variety of technical films, photopapers, etc. Silberra S-19 Developer, unlike most contrast developers, doesn't reduce actual sensitivity of materials (it can be used for push processing), gives minimal fog and minimal tinting of the emulsion. Silberra S-19 provides higher maximum image density, has long shelf life and high usage limit. The grain provided by Silberra S-19 is less than usual. A working solution is prepared by pouring the contents of the packs into water while continuously stirring the solution using a glass stick or special plastic stirring stick for chemicals. Use of distilled or filtered water is strongly recommended. 1) Warm 750 ml of water up to 48-50C (use a mix of hot and cold water, or use microwave to warm up the water). Do not begin mixing the contents of pack #2 until pack one is completely dissolved. If any lumps of powder form in your solution, they can be broken down with your stirring stick. As soon as the working solution is ready (powders are totally dissolved), add cold water to make up to 1 litre and stir. Allow the solution to cool to room temperature, nominally 20-22 C. At this point the developer is ready to use. Filtering the solution is not obligatory but recommended option. Average development time for fiber-based papers is 1-2 minutes, for resin-coated papers - 50-80 seconds. To decrease the contrast dilute the solution (1 :1 with distilled water) and increase the development time by 50%. Silberra S-19 working solution can be used to process 1 sq.m. of photo paper per 1 litre of the developer (about 20 sheets of 18x24 cm) or up to 16 films of 135/36 type. Keep Silberra S-19 Developer in cool, dry and dark place. Keep away from children. Some darkening and slight staining of the solution may take place during storage; such effects don’t have any influence upon chemical properties of working solution. It is optimal to store your working solution in opaque, chemically inert and tightly sealed containers with minimal air space in order to reduce oxidation. 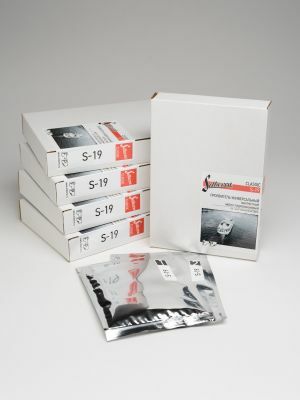 Sealed Silberra S-19 powder packs can be stored for up to 12 months past the production date. S-19 Developer working solution can be stored for 8 months past the production date (in a tightly sealed bottle). Developer that has been partly used can be stored in a closed bottle for up to 1 month.